Released in 1978 by Kenner, the Electronic Play ‘n Playback Organ is really three toys in one. It’s a musical instrument, a music player, and a recorder. 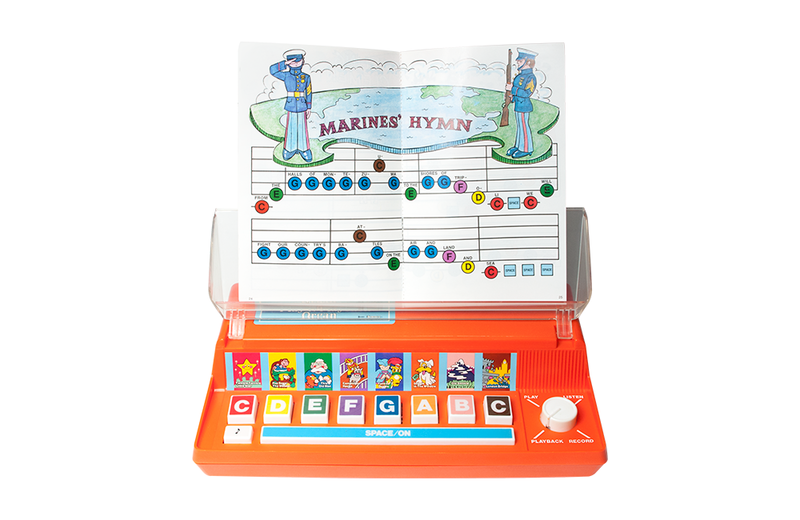 Powered by a single 9-volt battery, the orange toy consists of a color-coded keyboard of 8 keys, a space bar, and a white selector knob. It plays in two octaves, has volume control, and an automatic turn-off switch. Turning the selector knob to the “listen” position provides access to 8 pre-programmed songs, like Camptown Races, Yankee Doodle, and London Bridge. Each song is performed by pressing a single note on the keyboard. Turning the knob to “play” allows children to make their own music or follow along with the color-coded “22 Favorite Songs” music book. The book is illustrated with words, pictures, and all the notes required to play a number of classic children’s songs, including Three Blind Mice, She’ll Be Comin’ Round the Mountain, and Jingle Bells. Children can also record their musical inspirations and play them back, with the notes they made automatically arranged in a 4-4 rhythm. The Electronic Play ‘n Playback Organ was part of Kenner’s Discovery Time product line, which included Sof’ Sounds, Milky the Marvelous Milking Cow, Trail Tracker Hound Dog, and the Family Treehouse.